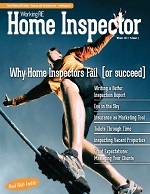 Annual Home Inspections: New Frontier? 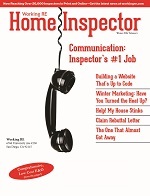 Editor’s Note: This story appears in Working RE Home Inspector’s NEW January Print Edition. OREP E&O insureds receive guaranteed delivery of each print issue along with many other valuable business benefits. 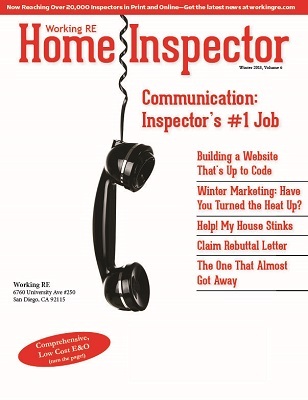 > Now reaching 20,000+ Home Inspectors in Print and Online! There is no question that lives are busier and more scheduled than ever before. Weekends are really just an extension of the work week with birthday parties, soccer, family events, work commitments, church, a night out, or an endless list of other commitments; it is often Monday before we know it. As inspectors, you likely see the implications of this with every inspection: more deferred maintenance. Homeowners aren’t puttering around checking on things and making small but meaningful adjustments to their abode, and it shows. Add to that, the next generation of buyers, millennials, who have less knowledge than any generation before when it comes to the TLC that a home needs. Their childhoods were equally scheduled, and spending time doing projects around the house “with dad” just didn’t happen for the most part. As such, many of them don’t know the fundamentals of what needs to get done (gutter cleaning, changing an HVAC filter, etc.) and when, never mind how. With that shifting landscape in mind, let’s take a look at some of common issues when it comes to the annual home maintenance concept. 1. Follow-Up – In order to be successful in keeping a relationship with the homeowner, and setting the stage for coming back in a year (and every year), the messaging to the homeowner from the first point of engagement has to be: “I’m not here for this one transaction only but I am an ongoing resource.” If that isn’t done, and you try to reach out 12 months later to get work, well…I can tell you from experience that it is incredibly difficult. 2. Fear of Clients – I’ve been on enough trade show floors with inspectors to know that there is a tendency for some to fear staying in touch with previous clients. Some inspectors cringe when their phone rings from someone they did an inspection for in the last year. Anyone who has that fear will not succeed with this, as it is necessary to build a relationship. I’ll add this observation that in the last five years more inspectors are realizing that staying in touch with clients isn’t such a bad thing. 3. Messaging – Most homeowners get the concept when presented to them in a way that makes sense, such as: “We take our cars to mechanics for checkups; we take ourselves to doctors but who has inspected your largest investment since you bought it?” Almost without exception, people get this and understand the objective. 4. Deliverable – The work product for a home inspection needs to be rethought to offer value to the homeowner when done on an annual basis. The homeowner needs a two to three page report at the most, not a 40-page document. They are looking for an easy to understand to-do list. 5. Thinking Like an Inspector – This may be the largest challenge of them all. Having been in the field with a number of inspectors exploring this concept, the orientation is to offer a typical scope of work and inspection. Keep in mind, there is no agent involved, so cosmetic items can and should be brought up and improvements to the home suggested. Furthermore, from a time and scope perspective, it isn’t logical to get caught up in doing things that aren’t necessary (opening windows, turning on sinks…the homeowner lives there and can tell you) or spending too much time investigating problems (Why is this happening?). For the purposes of an annual home inspection, it is important to be sensitive to your role and the amount of time spent on the project. It therefore is better to direct the homeowner to a person who has the time and the skillset to fully assess what might be going on, rather than speculate. 6. Offering Problems, not Solutions – A home inspection is about identifying issues and problems. However, inspectors generally don’t tie those issues directly to a pro who can do the work. I’d suggest that relationships with home pros are an integral part of doing annual home inspections and actually needs to become a core competency of the inspector. If a homeowner is given a list of things to do, without a person to call, they likely will be in the same boat next year and if they are, why bother having you back to identify the same things as last year? If you plan to dive into this new source of business, study the above in some detail. Great inspectors think like great inspectors. That is the nature of being experienced in an industry and honing your craft. Getting proficient at your task is a matter of optimization (efficiency), risk reduction and self-preservation. But inspections require a fresh approach. Annual inspections need not be limited to property deficiencies, for instance. Sitting down with your client and asking them what they’d like to accomplish in their home may be a cornerstone of what you are offering. Further, because they live in the home and would value small repairs, why not do something while on site such as adjust a door spring, or grease a track on a garage door, or put some caulk around a window? This is not something you would do in a traditional home inspection but would be greatly appreciated by the owner (check with your inspector E&O provider as most policies do not cover repairs). Think more like a consultant/coach and less like a traditional inspector. Consider doing annual reviews on homes from your vantage point as an inspector. What would it be like to have something like this as part of an inspection business? Here are a few of the benefits that immediately come to mind: one could have business booked in advance of the year even starting. Relationships would form directly with homeowners and you’d probably get a lot higher percentage of referrals from them. Hires could be added and they could be put right to work on these projects, provided they are trained and competent. The down season wouldn’t have to be so slow…maybe multi-inspector firms wouldn’t have to lay inspectors off for a period of the year. If the real estate sales take a turn for the worse or if people start skipping home inspections (as they are in some hot markets like Toronto), you’d be more insulated. Is there risk? Of course. There is with any business. As anyone will tell you, it is all about risk management and that starts with great communication, a clear scope, top-rate service and a quality product. But none of these are new to inspectors. What is new is the shift in mindset from the way an inspection practice works today and what goes into to being successful at this. In fact it can’t be underestimated. Use all the knowledge but not all the protocols is the simplest way to say it. We all know the logic. Spend $100 today to prevent $1,000 (or more) later. Get peace of mind that you have a good handle on how your home is performing so you have fewer surprises. Treat your home like your largest asset and maximize your investment. This is all about education, awareness and conditioning. In the 1970s people hardly did home inspections, but today a friend (or father-in-law) would question your judgement in not getting one. The majority of homeowners want to protect their investment. They care for and love their homes. As the professional who first advises and educates them on it, the inspector is well-positioned to keep that relationship going, provided they speak about their role to the buyer from Day 1. Let them know you are their home consultant for life. Jack Huntress is the founder and CEO of HomeBinder, an online “digital 3-ring binder” for the homeowner (to store everything about their home down to paint colors) that inspectors give to help market their business to both agents and homeowners. He has a background in environmental consulting and previously helped EDR roll out the Neighborhood Environmental Report to home inspectors as well as an online learning platform. He can be reached at jack@homebinder.com. 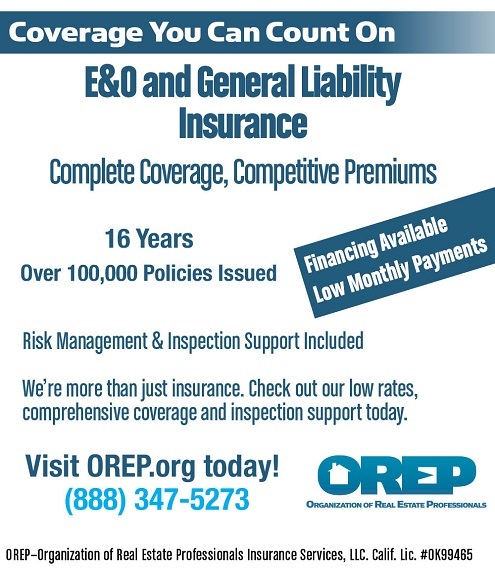 David Brauner, Senior Broker at OREP, shares insights and advice gained over 20+ years of providing E&O insurance for inspectors, showing you how to protect yourself and your business. Watch Now! 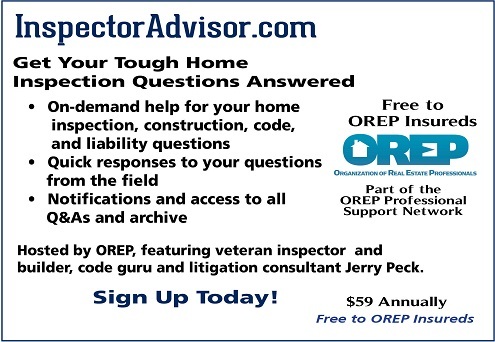 Note: The January 2018 issue of Working RE Inspector mailed to over 20,000 home inspectors nationwide. OREP Insureds enjoy guaranteed delivery of each print magazine and many more benefits. Having Your Day in Court: And Winning! Don’t Inspect for Pests – Sued Anyway?